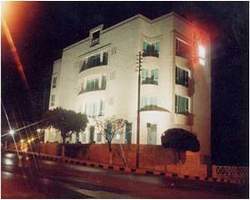 The Red Rose Hotel Suites are located at Um Uthaina area, one of the best commercial centers in Amman. It is only 10 minutes away from the Old City center and 30 minutes away from Queen Alia International Airport. Individually controlled air & heating units. Satellite system with 20 international channels & Inhouse movies. Located on the ground floor, off the main lobby. A relaxed and informal all day dining room. You would experience the taste & the smell of an excellent five star Interational Cuisine. BusinessCenter (secretariet services) - Travel Arrangements - Reservation Confirmation - Rent a Car Service - Free on premise parking - Safety deposit boxes - Free daily newspaper - E-mail and fax services. Extreme Disco: For evening entertainment, Extreme Disco is the hotel's most elegant nightclub. Disco music is played daily. You can enjoy an exciting atmosphere and music all night long.